﻿ What is the best motorbike for touring? If you decide that you want to go touring on two wheels, the first decision you need to make is what motorbike you will use. Getting this wrong has the potential to make or break your trip. The starting point should be the type of touring you intend to do. A lightweight off-roader may be the perfect choice to explore the Trans European Trail, but will be horribly uncomfortable and impractical on the motorway. Likewise, you don’t want to explore the UK’s green lanes on a Gold Wing, but it would make perfect sense on an Autobahn-based tour of Germany. If your tour will be road-based, there are still decisions to be made. Although it’s possible to tour on a superbike (ask Nick Sanders or Sjaak Lucassen), it’s certainly not for everyone. If you are travelling fairly light and want to make the most of some twisty roads there’s no reason to rule out a sportsbike. If you want to be self-sufficient and carry camping equipment and/or a pillion, a sports tourer, adventure sport or a full-dress tourer could be your ideal choice. Here are some options to consider for exploring on tarmac. If you’re going on a comparatively short trip (a long weekend to a fortnight) and you’re staying in hotels there’s no reason whatsoever not to use a sportsbike if that’s what you have. Covering ground quickly won’t be an issue, and the pay-off for sore wrists, back and legs on longer stints will be the bike’s ability when you reach a ribbon of twisting tarmac. Nick Sanders has ridden a Yamaha R1 around the world on more than one occasion and won’t hear a word said against it. "Wherever you are riding the fact that you’re on an R1 means that it’s an exciting ride. People think that riding around the world is all off road, but there are some absolutely amazing roads around the world that were just built for sports bikes. "You can ride over the Alps and have an hour of the twisties. 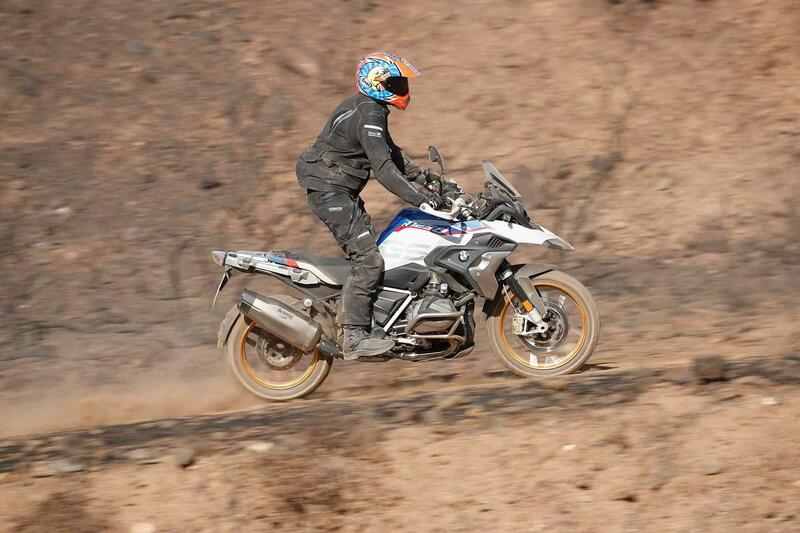 Try crossing the Andes – it’s five hours of sportsbike bliss." 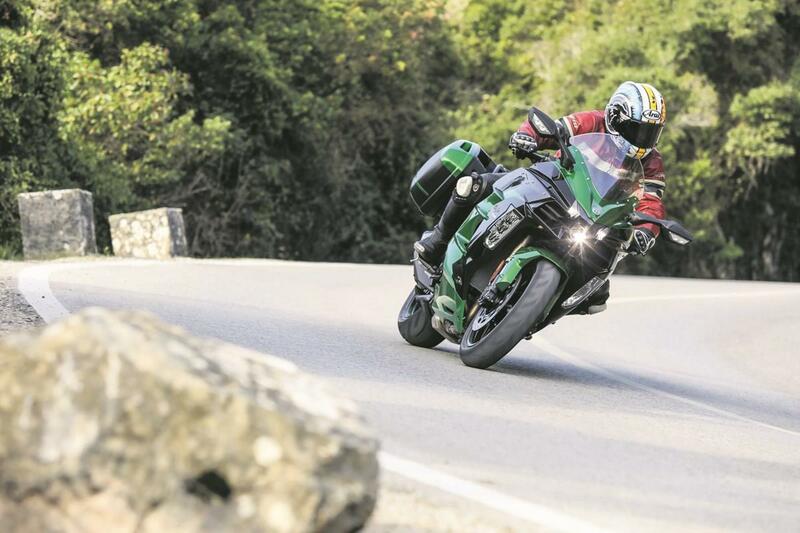 A supercharged, 197bhp Kawasaki may not sound like the ideal tool for a bike tour, but that’s exactly what it is. MCN Deputy Editor, Richard Newland rode almost 715 miles in a day on his H2 long-term test bike to see how it faired. "Home. The trip says 714.5 miles, the clock says 10:30pm. Exactly 18-hours in the saddle with nothing but fuel breaks – and I feel fine. The H2 SX might be a compromise, but it’s a bloody good one. "The comfort is impressive, and on fast flowing A and B roads it’s sporting prowess never fails to deliver. Maybe compromise isn’t such a dirty word after all." Other examples of sports tourer models include the Honda VFR1200F, BMW R1200RS and Suzuki Hayabusa. Adventure bikes have grown in size and become increasingly powerful over the years and manufacturers noticed that many were used predominantly or even exclusively on the road. This led to the creation of the adventure sport. Adventure sports look at first glance like adventure bikes, but their small wheels, road tyres and sporty suspension mean they were never destined for dirt tracks or sand dunes. The Ducati Multistrada, like many adventure sports models takes its donor engine from a sportsbike, in the case of the 1200, the Ducati 1198 and builds a pliable and comfortable bike around it. 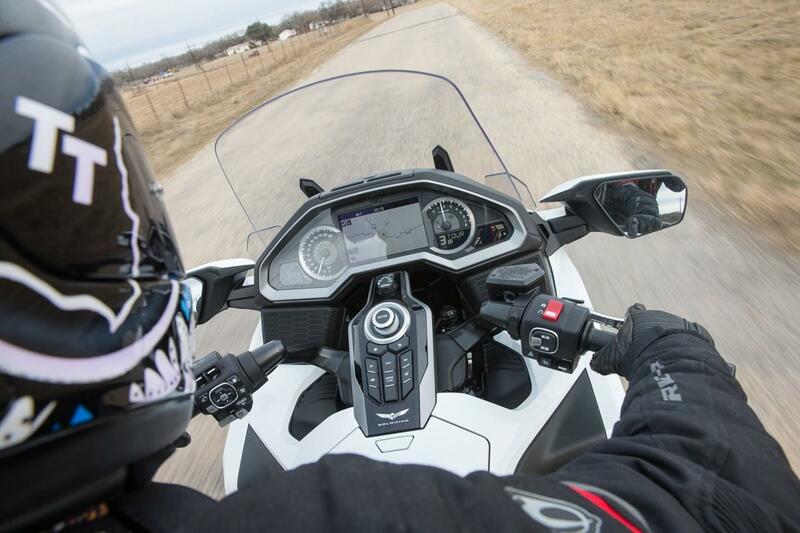 There are versions of the Multistrada that will take you off-road, but the base model is most at home on the tarmac. Other adventure sports models include the BMW S1000XR, Kawasaki Versys 1000, and Triumph Tiger Sport. Full dress tourers are the ultimate in two-wheel comfort. 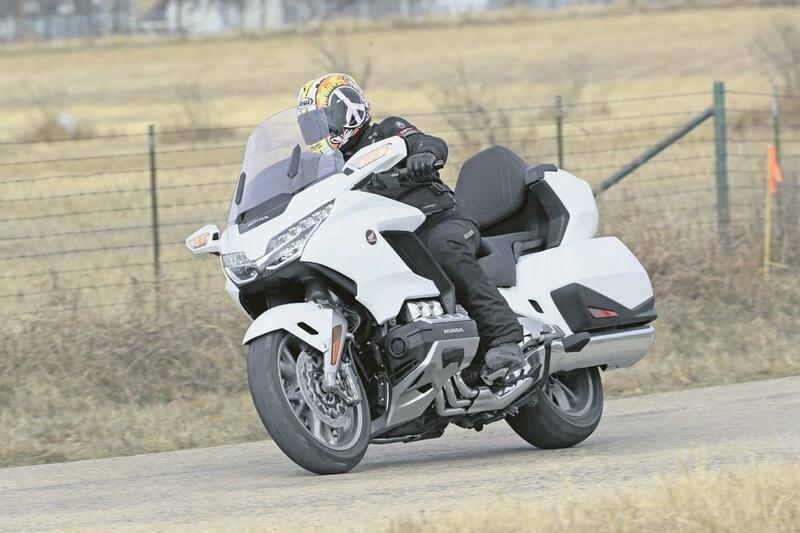 Top-end versions of the Honda Gold Wing over the years have included features from stereo systems to airbags and hot air vents to keep you warm. The pillion provision is incredibly plush and the bike’s high starting weight and flat-six 1800cc engine make carrying large quantities of luggage a cinch. If you plan on cruising around in a relaxed fashion with lots of luggage and a pillion, a full dress tourer could be the perfect solution. In the true spirit of adventure, it could be that you don’t really know how much off-roading you will do on your trip. Or that you don’t want to rule it out as an option. Even if you intend to explore the dirt, you could still need to travel for long periods on the road in between. A bigger-capacity adventure bike is the ideal weapon of choice in this scenario. Many riders use big adventure bikes for road trips, too, due to their ability to carry luggage and comfortable riding position. There’s a BMW GS to suit your trip however much off-roading you fancy, and the big German is more than capable of munching the miles on tarmac, too. The R1250GS models are the latest in a line of bikes that have been the choice of globetrotters and over-landers for years. its large boxer engine and shaft-drive make it incredibly reliable and its big fuel tank means long stints between fill-ups. Other large adventure bikes include the KTM Adventure, Honda Africa Twin and Ducati Multistrada. For some, the whole point of touring is to get off the beaten path and explore as much of the world as possible. While modern adventure bikes like the BMW GS and Ducati Multistrada are perfectly capable of getting their tyres muddy (especially in Enduro or Adventure format), it may be worth considering a lighter alternative to have more fun on the trails. The onset of very large adventure bikes left a bit of a gap in the market for smaller, livelier models but the new KTM 790 Adventure R, Honda CB500X and incoming Yamaha Ténéré 700 all seem to mark a return to the format. Who are we to argue with Nick Sanders? There are plenty of great value used R1s out there to choose from if you want to take the sportsbike route. Suzuki Hayabusas like this can be picked up relatively cheaply even with low mileage. Despite their slightly thuggish reputation and the part they played in the gentleman’s agreement between manufacturers, they make an excellent touring option. True adventure sports are a fairly new phenomenon, and so there are fewer used bargains to be had. This Yamaha FZ1 Fazer is based on roughly the same idea, taking a 2002 Yamaha R1 engine and building a comfortable, upright motorbike around it. Gold Wings hold their value pretty well and cost an astonishing amount of money new (this version would have been around £24,999). Higher mileages shouldn’t necessarily put you off as car-like engine displacement means car-like reliability. The R1200GS has been around for a long time and there are some great used examples on the market. BMW offered an enormous catalogue of extras, and plenty of aftermarket companies got in on the act, too. The reliability of Yamaha’s single-cylinder off-roaders has been proven over the years and the 660cc version in this XT is no different. Lighter and easier to handle off-road than the bigger adventure bikes, the XT can get tiresome on the motorway but it will manage it.